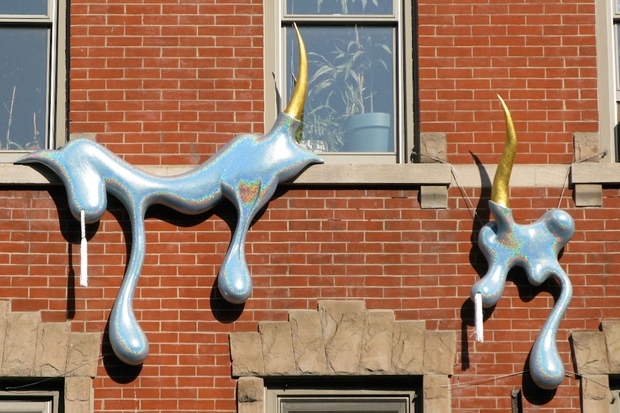 Sculptures by designer Mark Ravitz have adorned 200 Seventh Ave. since 1980. He unveiled the latest set earlier this month. PARK SLOPE — An artist who designed concert sets for musicians including David Bowie and Whitney Houston recently unveiled new work aimed at a much smaller audience: people strolling down Seventh Avenue. 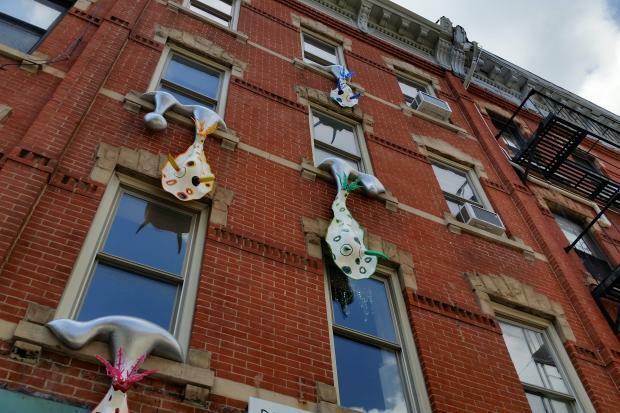 Designer Mark Ravitz, who also helped KISS and the Backstreet Boys stage their shows, installed four of his sculptures earlier this month on the front of his home at 200 Seventh Ave., between Second and Third streets. It's the 10th mini public art exhibit Ravitz has mounted on the building's facade since 1980, when it first dawned on him that he could use his building's exterior as his own personal gallery. "I have the ability to put something out in public and a lot of people don't, so I took advantage of it," said Ravitz, who's lived in the building with his wife and son since the 1970s. 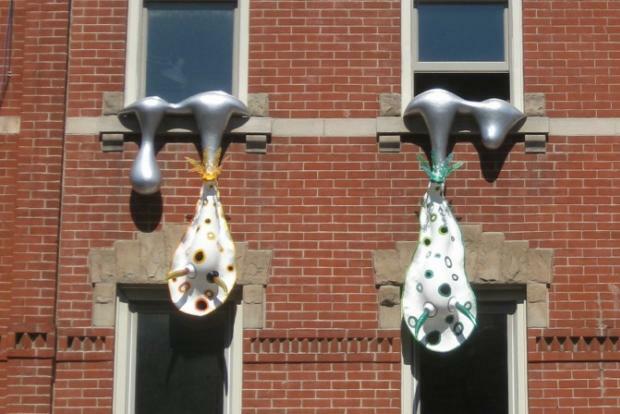 "I just want people to take it in and enjoy," he said of the sculptures, which resemble alien life forms oozing out of the building's upper floor windows. The sculptures dangle from the building's second, third and fourth floor windows, and some passers-by never glance up to see them, Ravitz said. But some of Ravitz's previous work found a worldwide audience. Working with famed lighting designer Jules Fisher, he designed the set for David Bowie's "Diamond Dogs" tour in 1974. He also created the decor for the famed Studio 54 Halloween parties in the late 1970s, built the now iconic logo for the heavy metal band KISS in his living room, and designed the sets for Bowie's 1987 "Glass Spider" tour. 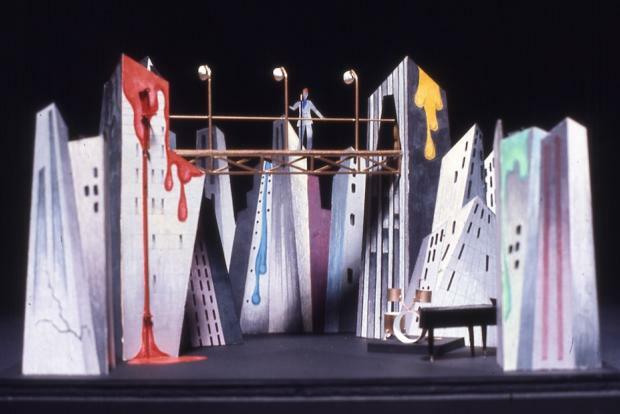 A model of David Bowie's "Diamond Dogs" set shows the painted drips that are a signature of Ravitz's work. Ravitz's brushes with the New York creative scene began early in his life. While he was growing up in Manhattan on 11th Street and Second Avenue, his father ran a laundry and dry cleaning business that counted artist Roy Lichtenstein among its customers. Young Ravitz delivered laundry to Lichtenstein's studio, where he got to see the artist's work up close. "I saw him in his environment and that was all very appealing to me," Ravitz said. He didn't realize what a big deal Lichtenstein was until Life magazine ran a spread on the pop art innovator, Ravitz said. Lichtenstein eventually gave Ravitz castoff art materials to experiment with, and Ravitz's dad traded laundry for art lessons from other neighborhood artists. After art school, Ravitz moved to Park Slope in 1972 because the neighborhood was full of affordable space. He married his wife, mixed media artist Jo Beth Ravitz, shortly afterward. They bought 200 Seventh Ave. in 1980 from a real estate company that was leaving the building's ground-floor retail space for greener pastures in Brooklyn Heights. Today Ravitz and his wife both work in a studio space on the building's second floor and their son lives upstairs. Every few years, when inspiration strikes, Ravitz makes a new set of sculptures to hang on the building's exterior. Ravitz in his studio. At right are some of the birds that previously adorned his building. 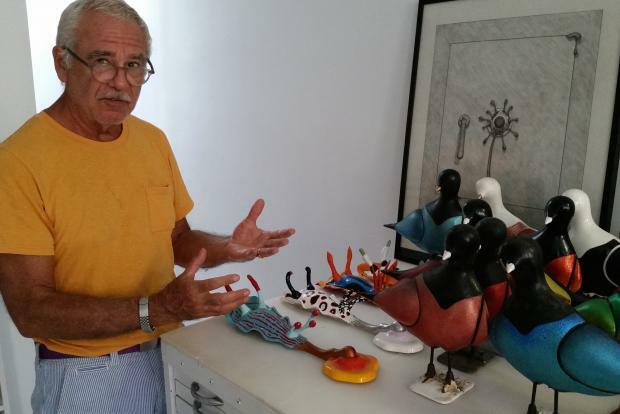 They are sometimes inspired by current events — a 1997 set of black and white spotted sculptures was called "Mad Cow" after mad cow disease — but more often they are simply about colors or fantastical ideas. A previous set of Ravitz's sculptures on 200 Seventh Ave. The Ravitz family regularly takes trips abroad to scuba dive, which is where Ravitz found the inspiration for his latest facade show. The set of sculptures, called "Nudidrips," is based on the nudibranch, a vividly colored undersea life form also called a sea slug.